Everyone (well everyone that is who writes an introduction to one of the editions of Modern Cookery*) agrees on the bare bones of Eliza Acton's life. She was born in 1799 and her father was a brewer. At 17 or so she opened a school for girls which ran for a few years and then she went to France. By 1826 she was back in England and a book of her poems was published. Other poems and articles subsequently appeared in newspapers but when she approached her publishers, Longmans, to print another volume of poetry (some time in the late 1830s) they sent her away suggesting that she might prefer to write a cookery book. Was the publisher serious or was this his idea of a cruel joke? “My dear Miss Acton, you have as much chance of getting these poems published as you do of writing a cookery book!” Or was he in the same entrepreneurial mould as Sam Beeton? “My dear Miss Acton, don't waste your talents on minor poetry. The future lies in the kitchen. If you want to make us both rich go forth and produce receipts.' Did he just want to be rid of her or did she already have a reputation as a bit of a foodie? Had he been to dinner at the Acton's and realised there was potential here? Did they discuss her future over lunch and did Eliza give him her views on the present state of English food? Why suggest to Eliza Acton, a spinster in her late 30s with literary pretensions, that she go away and write a recipe book? Sad to say we may never know, but in 1845 she was back on the door step with the manuscript of Modern Cookery for Private Families and the rest is history. The book was still in print in 1914, having run to forty editions (the last was 1908) and sold 60,000 copies. So what was so modern about Modern Cookery? Acton is concerned with with addressing a modern audience, hers is perhaps the first cookery book written specifically for an urban middle class. The full title Modern Cookery for Private Families makes it clear that her work is concerned with domestic cookery in the private home, not with professional cooks or haute cuisine. She dedicates Modern Cookery to 'the young housekeepers of England'. Were they servants employed as housekeepers or middle class women much like herself who were running their own household with limited means and few staff; women who may have been able to employ maids but probably didn't run to a full-time cook; who aspired to gentility but were also having to devote time to the management of their own homes in the absence of a professional housekeeper. She aims to present 'thoroughly explicit and minute instructions ' which may be 'readily comprehended and carried out by any class of learners'. She did not expect her readers to have had much if any previous cooking experience. To achieve her goals she employed two very modern approaches. She 'trusted nothing to others' and tested every receipt herself and she introduced the novel feature of a 'summary appended to the receipts, of the different ingredients which they contain, with the exact proportion of each, and the precise time required to dress the whole'. 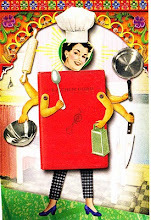 Hers is the first recipe book to suggest that cooking might be reduced to a rational and almost scientific discipline. It is these innovations, her personal comments and observations and her precise and practical approach, which really single Acton out as the first truly modern cookery writer. For the twenty first century reader it is the mix of the modern, ideas and recipes which still sound modern to our ears, with the quaint and old fashioned which makes Acton particularly interesting. Although her audience was becoming increasingly urbanised and able to purchase a wide range of ingredients she still writes for cooks who will have access to their own supplies of seasonal fruit and vegetables – she goes into great detail about the making of jams for instance and the likely variations in crops from year to year and her recipe for 'Birthday Syllabub' calls for a large bowl containing sugar, lemon juice, port wine, sherry and brandy to be placed directly under the cow 'and milk it full'. At the same time she is familiar with the work of 'Baron Leibeg' and the latest thinking on the nutritional value of foodstuffs. She is more cosmopolitan than her predecessors including recipes for curries and even recommending the use of ready made 'currie- paste' (preferably Captain White's), alongside exotic dishes such as 'The King of Oude's omlet' and 'Risotto à la Milanaise,' In the preface to the original 1845 edition of Modern Cookery she notes that although 'until within very recent years [English] cookery has remained far inferior to that of countries much less advanced in civilisation … we have ceased to be too bigoted, or too proud to profit by the superior information and experience of others upon any subject of utility.'. All the same there is a preponderance of traditional, often stodgy, recipes, for example nine different ways of preparing a calf's head. However modern some of the tastes roasting is still done on a spit, the oven is addressed as something of a novelty and although 'a goose, a leg of pork and a suckling pig, if properly attended to while in the oven, are said to be nearly, or quite as good as if roasted' baking is only really considered an option if you have no other choice. Along with a Bottle Jack for roasting meat Acton's well equipped kitchen requires 'two or three mortars in varying sizes', hair sieves and well tinned copped pans. Cooking was labour intensive and time consuming. Merely to please the eye by such fanciful and elaborate decorations as distinguish many modern dinners, or to flatter the palate by the production of new and enticing dainties, ought not to be the principal aim...of any work on cookery. Her detailed instructions on how to 'broil' beef steaks (only season with pepper but never salt, heat the grid iron, turn the steaks 'but once') and how to make marmalade, and her recipes for very many dishes such as Christmas Pudding and 'English Sauce for Salad' can be followed just as easily, and with excellent results, today as they could be in 1845. That said however the need to translate the original recipes into modern measurements and cooking times and temperatures perhaps makes Modern Cookery less appealing today than it was originally (although the Quadrille edition does come with a conversion chart). A close reading of Acton only confirms that whilst the present day modern cook has access to a bewildering range of ingredients and kitchen equipment may have changed significantly basic techniques of course have not. It is equally clear that her attention to detail has ensured that her recipes have provided the foundation for subsequent generations of cookery writers. Where did her recipes come from? She tells us that the 'toil' of writing Modern Cookery was 'so completely at variance with all the previous habits of my life' which suggests she may not have had much first hand experience of cooking. Her mother had taken in boarders from the Tonbridge School so perhaps some like that for 'Bordyke Veal Cake' (named after their residence in Tonbridge) and 'Acton Gingerbread' originated in the family kitchen. She makes clear that some s are the 'Author's original recipe'. Eliza had travelled to France so perhaps some of her knowledge of French and even of German and Italian cooking was acquired then. Perhaps she had a reputation for keeping a good table and a good cook in her kitchen who did much of the experimenting (Although given her attitude too plagiarism, the 'unscrupulous' appropriation of 'large portions' of her work 'without the slightest acknowledgement', she would undoubtedly have given credit where it was due if this was the case.). She was the eldest of five children so perhaps she swapped recipe ideas with her siblings and other members of her extended family ('Aunt Charlotte's Biscuits' for example). She credits some of her sources such as 'a highly intelligent medical man who has been for twenty years a resident in the Mauritius', 'a friend who had long experience ...in India, 'an American gentleman'. The range of her recipes and the depth of her knowledge, both of techniques and of foreign foods, suggests a lively interest in all aspects of food and its preparation and a broad circle of friends and acquaintances with whom she discussed her work. Recipe books don't tell us what people actually ate. They give us an idea of what the household might have aspired to eat, what foodstuffs were perhaps generally available but not which dishes actually appeared regularly on the dinner table. Regardless of social status the Victorian dinner was very much hostage to the cook and her skills, enthusiasm and experience. Acton's book is a mixture of nostalgia for the past, traditional plain English fare, up to the minute ideas and exotic specialities. In England, French food or French influenced cooking had been the preserve of the wealthy who could employ foreign chefs. Acton brings 'foreign' food within the realm of the those 'private families' with social pretensions and a regard for fashion. Did the households who still had access to their own cow for fresh milk also experiment with 'A Simple Syrian Pilaw'? Did families sitting down to a boiled calf's head accompany it with 'Curried Macaroni' or with a 'Puree of Tomatas'? The food on the Victorian dinner table had the potential to be appetising and varied although it might only have been the tables of the wealthier more urban families which ran to such variety. The best pasta for example was to be had from Mr Cobbett's of Pall Mall which 'is not a professedly cheap house, but all that he supplies is of excellent quality'. What Modern Cookery does do is give a glimpse into a world on the verge of great changes, a taste of cookery on the brink of what we now call modern. Isabella Beeton's Book of Household Management may be better known today but given that a fair percentage of Beeton's recipes are lifted straight from Modern Cookery ***, Acton should at least be credited with her contribution to Beeton's success. Elizabeth David asserts that 'it is difficult to find any standard cookery compendium of the latter part of the Victorian era ...which do not include a quantity of Miss Acton's recipes'. Moreover Mrs David considers Miss Acton's volume to be 'the greatest cookery book in our language'. A biography of Eliza Acton The Real Mrs Beeton. The Story of Eliza Acton by Sheila Hardy is due to be published by History Press in October 2011. ** She goes on to say 'particularly as it is from these classes that the men principally emanate to whose indefatigable industry, high intelligence, and active genius, we are mainly indebted for our advancement in science, in art, in literature, and in general civilisation' which just goes to show that she wasn't all that modern in her thinking! *** In The Short Life and Long Times of Mrs Beeton (Harper Perennial, London, 2006) Kathryn Hughes attributes a third of Beeton's soup recipes, a quarter of her fish dishes and 'many other preparations besides' to Eliza Acton.